We are happy to announce the release of the free Optenni MDIF Utility to support the optimization of tunable and switchable matching circuits using our Optenni Lab matching circuit design software. The utility is an easy-to-use graphical tool to pack a set of S-parameter files in Touchstone format into a single, parameterized MDIF file. The number of S-parameter files or ports is not limited. User libraries for arbitrary two-port components, e.g. a set of transformers, filters or a custom set of inductors/capacitors can be packed into an MDIF file and used in the manually entered matching topology. In addition to the S parameter data, the Optenni MDIF Utility can also store component metadata for documentation purposes, see below for more infomation. Download your copy of the Optenni MDIF Utility here – it is completely free! For tunable matching circuit design, a new component type, Switch, was launched with Optenni Lab version 3.3. It is using an MDIF representation for the switch, and Optenni Lab optimizes the switch state for each target frequency set together with the fixed matching components, by automatically scanning through all switch state combinations. 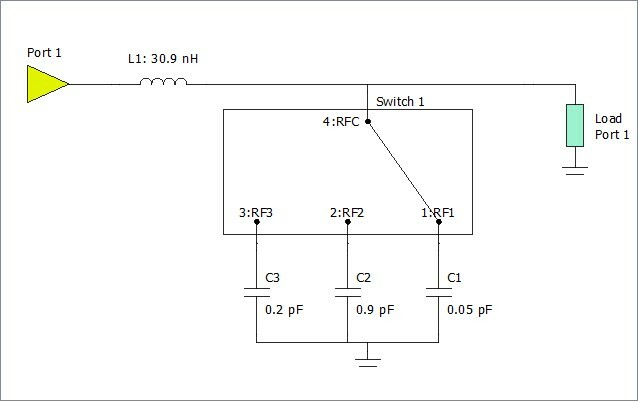 This process dramatically simplifies design that utilizes multiple parallel throw states available in modern switches. Moreover, we have complemented the Optenni MDIF Utility with the possibility to include switch-specific metadata for documentation purposes: voltage/current/power rating, component name, pin names, manufacturer and brief description. This metadata is implemented as comments and does not prevent using the file in any application supporting the MDIF format. However, this information is read in and utilized in Optenni Lab, for example to label the switch ports accordingly. An example of a multiport switch where the port labels (RFC, RF1, RF2 and RF3) are read from the MDIF metadata written by the Optenni MDIF Utility.